What About Sign Language, Speech Tablets, and Other Communication Forms? In addition to direct speech therapy, many therapists recommend the use of sign language, picture books, communication devices and other means to augment speech in the child who is not clearly understood. This approach may be called “total communication.” Having the child pair a vocal word attempt with a sign enhances the chance that the listener will be able to “catch” the communication (if the spoken word isn’t understood, perhaps the sign will be). Having others understand the communication can offer the child motivation and the feeling of success in using their voice to communicate. Today, newer technology is coming into play in a big way. Electronic tablets such as the iPad and special communication “apps” are being used more and more as support for communication in children with all kinds of speech problems. 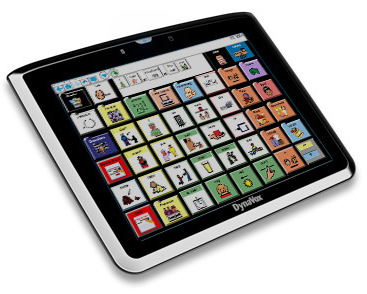 These devices are catching on because they are relatively inexpensive compared to dedicated augmentative communication devices; parents and children can catch on quickly at home; and speech therapists are able to use apps and tables in their practice for multiple children. Many children with apraxia of speech, even at young ages, have some awareness of their difficulty. Parents should not fear using other forms of communication, even if temporarily, in order to support successful communication. Providing successful communication experiences only encourages the child. Of particular usefulness for children with apraxia of speech, signs can become important visual cues to help them know how to place their mouths, etc. in order to produce the desired word. When pairing of spoken word and sign is consistent, the child may come to associate the visual image of the sign with the placement of their articulators and thus, the sign alone may become a “cue” for the speech attempt. In a few children, sign may not be appropriate. For example, for some children signing might be too distracting or their ability to consistently form a sign may be impaired. Also, parents should never see iPad apps as “the answer” for their child’s speech improvement. Nothing – nothing – can replace direct person to person interaction and support to teach and help our children with apraxia of speech. Young children should not be using the iPad speech therapy apps by themselves. Rather, parents should be with the child to enable the most appropriate and successful practice opportunities and provide direct human interaction at the same time. Often when someone raises the idea of using sign language for a child with apraxia, parents may experience confusion and even fear. After all, “The child can hear just fine! Why would we use sign language for a hearing child?” Or “But won’t using the sign mean my child won’t need to talk? Won’t it keep him/her from speaking?” Conversely, some parents report that their child’s speech language pathologist has told them that the child will rely on sign and thus not learn to speak. This article attempts to address many of these myths about signing. First of all, in our mainstream culture it is true that we most often see images of sign language associated with people who are deaf or hard of hearing. However, that doesn’t mean that for some children – those with apraxia – that sign cannot help! For children with apraxia the sign can be used to assist and augment their verbal communication, sort of as a bridge to communication while they are learning to speak clearly. The use of signing with children who have apraxia has nothing to do with their ability to hear or understand the spoken word. Most children with apraxia have very good receptive language skills. Secondly, it is rare that a child’s speech output is diminished by using sign language. To the contrary, therapists and parents alike nearly always report a heightened willingness to try new words and say more. Nearly all parents are actually quite relieved when their child starts to use some signs to help with communication. It makes life easier for the child and the parent! For just a few children with apraxia of speech, sign may not be indicated. These children have additional severe motor planning difficulties with their arms and hands, making it extremely difficult for the child to use a fairly consistent manual sign to represent a word. However, it is possible that even these children can benefit from sign if the adult uses the sign as a form of visual cueing (explained in more detail below). And it is not necessary that the child’s sign is “perfect,” just that they can be fairly consistent with whatever approximation of a sign they can achieve. Reduce Frustration: Reduce frustration and have basic needs understood. Children who have access to sign language are at least able to communicate at some level, which usually results in decreased frustration on their part and yours. Symbolic Communication: Sign can be important to young children with little or no speech because it is symbolic communication. They are learning that they can label things and use the signs to communicate. This is important for all children. Those with typically developing speech are doing so with speech attempts – words. Our children with speech apraxia also need a way to do this so that this part of the process of acquiring language is not further delayed. Expansion of Expressive Speech: For children who have apraxia and who are really struggling to sequence sounds into words, sign can be a mechanism to insure that their expressive language development isn’t further impeded. Speech production is just that: producing speech. Expressive language is the ability to understand and properly use the rules of the language to construct sentences. So a child with apraxia is at risk, due to the speech production struggle, of also falling seriously behind in expressive language since they have no means to try out and practice how words go together to create meaningful and proper messages. Using sign assists children to keep expanding their expressive language. While they may not be able to speak a word or put two words together, they can still, by using sign, be doing this same thing in a different way. Successful Communication: Children with apraxia who use sign, may also use it as an assist for the listener when accompanied by their vocal attempts. They may be capable of, for example, three word sentences in which each word is an approximation, not properly articulated, and thus the listener may not understand their message. When the child uses sign, along with the vocal attempt, the listener (if they know the signs) can have a better chance of understanding the message and thus, the child is successful at communication. Our children very much need to feel successful in their attempts to use their voice to communicate. If when attempting to use their voice to communicate, no one ever understands, it is not uncommon for them to just stop trying to use their voice. When they are understood (perhaps because they also used sign) they are delighted to realize they were successful and are more likely to keep on trying. Controls Rate of Speech: You will notice that when the adult uses sign, and even when the child uses sign, it has the tendency of slowing down the rate of speech for most people (obviously not for interpreters perhaps!). For some children with apraxia, this is very helpful for them to have the additional time to allow for motoric transitions between words, etc. It gives them a better chance, in many cases, of also being able to imitate you. Many adults speak fast and that can have a negative effect on a child with apraxia’s ability to imitate you. Serves as Visual Cues: It is pretty much universally agreed that multi-sensory input is helpful to children with apraxia of speech. The literature is full of examples of “cues” from various modalities that, when consistently paired with verbal attempts, can trigger for the child access to the motor plan they need to produce the word, sound, or sound sequence correctly. One very powerful modality for many children with apraxia is visual (thus the term “visual cues”). When the adult is also using sign to “cue” the child, and an association between the visual cue and the word or sound has been made over time, just the sight of the “cue” can help the child produce the correct word. Sometimes a sign for an alphabet letter may be used in conjunction with a location to cue a sound (sign for “K” being held at the throat). As a child’s speech becomes more intelligible, they almost always drop their use of the signs. However, many parents and therapists will continue to use a sign themselves for the purpose of providing a visual cue for sound or word production when the child is struggling. Kinesthetic Reinforcement: Some people believe that the use of manual sign provides the kinesthetic reinforcement of volitional movements and sequencing when accompanying the verbal attempt. Speech-language pathologists who successfully use sign language with children who have apraxia do not have the child using the signs in isolation. Instead, they are encouraging the child to use signs along with verbal attempts. Therapists and parents need to work together in partnership on all aspects of a child’s therapy, including the use of manual sign language to augment speech attempts. By providing multiple cues, the therapist has the opportunity to gradually fade the cues in small steps, assuring success for the child in using his/her own verbal skill. For example, if the sign for “more” is used along with the word “more,” the therapist can fade to the sign plus the “mm” sound cue; to the sign plus the visual lip position for “m”; to the sign by itself; and finally to a question prompt. This also facilitates movement away from simple, immediate verbal imitation. Although a necessary initial strategy, if the child comes to rely just on direct imitation, the likelihood of more rapid development of the targeted speech motor patterns decreases. I have often seen children who wait for the entire verbal stimulus before attempting a word, despite long-term therapy intervention. Of course, this depends on the familiarity with the targeted word, but if the child has demonstrated consistent success on direct verbal imitation, challenging the child by fading verbal cues should be encouraged. Sign language should be seen primarily as a prompt for verbal speech. The reason that I like signing is that it can be brought close to the face to better assure that the child also focuses on oral cues provided. It is, of course, beneficial if the child is able to use signing to facilitate communication success as he/she works on verbal speech production. However, if it becomes too cumbersome for the child, it may be counterproductive. The therapist should not stop using sign language because of this, but continue its use as a prompt. Too many prompts can confuse the child, especially if he/she struggles with fine motor skills, attention issues, or language processing. One child that I saw in therapy tended to self-stimulate with finger movements, and any attempt at signing increased this self-stimulation. Other children cannot put the energy and focus on both signing and speaking, but again it is not critical that the children always sign. Although relatively rare, there are situations, therefore, that signing and/or other cueing may not be facilitory. With only verbal cues available, however, progress can be quite challenging. The use of AAC requires a skilled evaluator and trainer to insure the child’s needs and abilities are properly considered. For SLPs who do not feel adequately trained or skilled in AAC methods, evaluation, and treatment, arrange for or request technical assistance. Please note that with proper planning and implementation, AAC is extremely unlikely to interfere with the child’s development of speech. If providing support to an AAC user, SLPs should familiarize themselves with the benefits and current research literature on AAC. a not-for-profit charitable organization dedicated to the most effective communication for people who rely on augmentative and alternative communication (AAC). This question is increasingly asked as parents and caregivers become more aware of the benefits and positive outcomes of augmentative and alternative communication (AAC). My response to this question is that AAC is an appropriate consideration very early in intervention. Typically-developing children use speech to function within these areas. When speech is not adequate to achieve the childs communicative purposes, it is necessary for the child to find a way to close any gaps. In terms of expressing wants and needs, AAC is a nice bridge between the need to communicate a message and actually getting your meaning across to another person. Children can use natural gestures, sign language, a communication book, a symbol (picture, photograph, line drawing, etc. ), and/or a speech-generating device to convey their intents. Exchange of information becomes essential in a school setting. The teacher requires that the child interacts within the classroom by asking/answering questions, participating in collaborative learning groups, and using increasingly more complex language. This exchange of information demonstrates to the teacher that the child has achieved levels of knowledge expected at various stages in development. For example, a child that is unable to say an s is going to have a difficult time indicating that he/she has learned the concept of plurals. This same child would easily be able to demonstrate the use of plurals using AAC. As children mature, the requirements to communicate multiply with the opportunities. Social environments become more diverse and filled with more communication partners. Making communication interactions functional and effective takes on greater importance because of the addition of these social influences. There is a chance that families will encounter speech-language pathologists who choose to focus on speech, while overlooking overall communication. A focus on speech is not wrong in and of itself. We all want our children to use natural speech. However, everyone on the childs team (including parents and peers) needs to step back and really look at that childs ability to communicate functionally within his/her various environments. Focus on what the child is currently able to communicate. Consider, if the progress in therapy is slow, how long are you willing to wait for the child to communicate? Is it ok to go through Kindergarten entirely without talking? First grade? There is a real difference between intelligibility (how understandable a child is using speech alone) and comprehensibility (which take speech into account along with context). Some AAC strategies put context into an interaction, and that may be sufficient to support the childs communication. These strategies might include alphabet (first letter) supplementation, indicating the topic being discussed, indicating a change in topic, etc. An evaluation to determine a particular childs needs is invaluable to determine the best AAC supports. When discussing AAC, one of the first concerns voiced by parents and caregivers is that use of AAC might prevent the child from talking, or further delay development of natural speech. In response, I refer to the excellent Cumley (2001) article included on the Apraxia-KIDSSM web site. His research demonstrated that AAC does not deter a child from using speech to communicate, if and when it is effective for him/her. Moreover, as speech increasingly becomes the primary mode of communication (with development of functional natural speech), AAC tools and strategies will be gradually phased out of the childs communicative strategies. In fact, the child will phase out use of AAC on his/her own, when speech becomes more effective and efficient. If you have decided to explore AAC as a means to help your child communicate for today, this is a specialized process that has many steps. Seek out a speech-language pathologist with expertise/knowledge in AAC. In the school system, these experts are often found on an Assistive Technology team, but may be identified by the district in many ways. Your childs current speech pathologist at school should assist you in this process. If you prefer to obtain this service in the community, it is important to contact various clinics to ensure that (1) the speech-language pathologist has expertise in AAC, and (2) during an evaluation your child will have an opportunity to interact with several different types of devices from different manufacturers. This will ensure that the device that best meets his/her needs is selected. We do expect children with apraxia to use natural speech as a primary mode of communication someday. In the meantime, it makes sense to use AAC as a means of communication (or to supplement communication) to aid in language development and reduce your childs frustration. Using AAC does not alter the need for intensive and frequent speech treatment. It just provides a means to bridge the gap between effective and ineffective communicative interactions. Although we never lose sight of our final goal using natural speech we also need to think in terms of appropriate and functional communication today. American Speech-Language-Hearing Association. “Augmentative and Alternative Communication: Knowledge and Skills for Service Delivery.” ASHA Supplement 22 (2002): 97-106. Beukelman, David R., and Pat Mirenda, eds. Augmentative and Alternative Communication: Management of Severe Communication Disorders in Children and Adults. Baltimore, Maryland: Paul H. Brookes Publishing Co., 1998. Caruso, Anthony A. and Edythe A. Strand, eds. Clinical Management of Motor Speech Disorders in Children. New York: Thieme Medical Publishers, Inc., 1999. Dowden, P. “Augmentative and Alternative Communication Decision Making for Children with Severely Unintelligible Speech.” Augmentative and Alternative Communication 13 (1997): 48-58. Light, J. “Interaction Involving Individuals Using Augmentative and Alternative Communication Systems: State of the Art and Future Directions.” Augmentative and Alternative Communication 4 (1988): 6-82. Dyann F. Rupp, M.S., CCC-SLP is a speech-language pathologist for the RiteCare Clinic of the Scottish Rite Masons in Lincoln, Nebraska. She received her M.S. from the University of Nebraska – Lincoln and has worked as a speech-language pathologist and assistive technology specialist in school and clinical settings. She can be reached atdrupp2@unl.edu. When is it appropriate to Consider Augmentative and Alternative Communication (AAC) for Children with Apraxia of Speech? My research has focused on determining the effect AAC has on the communication quality and quantity of children diagnosed with CAS or suspected CAS. Trying to determine why professionals and parents are reluctant to introduce AAC to this population is of great interest to me. Professionals and parents have the same goal for these children and that is for these children to talk. Both groups fear that if AAC is introduced into the intervention, then the child will not talk or stop talking. In addition, if AAC is introduced, there is the feeling that the professionals have given up on speech production. However, research has clearly not shown that. What it has consistently shown is that if AAC is introduced into the intervention plan of children with severe expressive communication disorders, there is often a marked increase in speech output. In my own research, when AAC was available to these children there was an increase in their speech usage or there was no marked decrease in speech usage. When looking across all the childrens communication modalities, it was found was that when AAC was available, there was a decrease in the use of gestures. Gestures are frequently used by children with DAS and often are a useful communication mode. However, frequently these gestures are not communicatively specific enough to convey the childs communication intent and result in their communication attempts being unsuccessful. AAC should be viewed as a positive means of supporting a childs speech attempts and a more communicatively efficient means of conveying their communication intent. The lack of AAC knowledge can be another reason professionals and parents are reluctant in introducing AAC into a childs intervention plan. Many professionals view AAC as only being associated with high tech voice output systems, which is not always the case. Yes, these children need to have a voice, but professionals and parents need to select which AAC system, high and/or low tech, best supports the communication intent of the communication situation. Children should always be provided with different multimodal communication options, such as speech, gestures, high and low tech AAC, and sign language as a means of communicating. The ultimate goal for children with DAS should be to provide them a successful means of communicating. AAC should not be viewed as giving up on speech, but rather viewing AAC as providing a means to support the childs speech attempts, increasing successful communication and providing a strategy for repairing frequent communication breakdowns. In summary, the introduction of AAC into the intervention plan of children with CAS should be viewed as using all communication modalities, including AAC that successfully support the speech attempts of this population and facilitates the access and successful participation in communication interactions. Children diagnosed with childhood apraxia of speech (CAS) struggle to communicate basic needs to even those closest to them. In addition to severely unintelligible speech, CAS is often accompanied by language and literacy deficits, academic difficulties, deficits in phonological processing and literacy, and social disadvantages (ASHA, 2007; Lewis, Freebairn, Hansen, Stein, Shriberg, Iyengar, et al., 2006; Overby, Carrell & Bernthal, 2007). Since children with CAS have such restricted sound systems, they cannot build more complex words and sentences, which in turn restricts their expressive language development. Children with CAS who communicated with voice output devices enhanced their expressive language by increasing mean length of utterances (MLU), increased overall language skills, increased number of words, number of different words, and multi-word messages, and increased speech accuracy (Cumley & Swanson, 1999; Miller, Light, & Schlosser, 2006; Stading, Ball, Larson, & Dulany, 2005). Miller and colleagues (2006) also found that supporting communication with a voice output device did not decrease the number of speech attempts. Research has also shown that children with CAS who use voice output devices were able to repair communication breakdowns, establish topics, have longer social interactions, participate more in academics, reduce non-communicative behaviors, and had people speaking for them less (Culp, 1989; Cumley & Swanson, 1999; Stading, et al., 2005). Despite the availability and supportive evidence of voice output devices, children with CAS frequently do not use them due to high cost, lack of insurance reimbursement, and parental fear of the child giving up on speech. Initial research has shown devices increase speech and language development and give the child a way to communicate more effectively with others. They provide a speech model during each communicative use, which is suspected to increase natural speech, expressive language and communicative effectiveness. However, no available research has determined the effectiveness of high-tech voice output devices compared to low-tech communication systems in their impact on components of speech and language development. This study compared the impact of high-tech voice output devices to low-tech communication systems and no-tech communication on accuracy of speech, expressive language, and communication interaction (CI) for children with CAS. Two children with severe CAS, between the ages of 5-6, participated in this study. Each child used mainly single words in speech productions, and had issues with intelligibility of spontaneous speech with all communication partners. Each child was able to navigate a dynamic display communication device. We utilized a single subject alternating-treatment design to measure the effects of high-tech, low-tech and no-tech (speech only) communication supports on speech, expressive language, and Communication Interaction for children with CAS. The study occurred over the course of a year. Each child received their own voice output device (i.e., DynaVox V) for the entire year in addition to low-tech communication boards (i.e., screen shots from their DynaVox V). The participants received individual therapy 3 times per week. Two sessions focused on speech sound development, and one session focused on use of the voice output communication device and low-tech communication boards. Half of each session was spent using the DynaVox V and half was spent using the low-tech communication board. The order was alternated each session. Training on use of the communication systems occurred for an average of 21 sessions, until each child passed a performance test with at least 80% accuracy to ensure competency of navigation on the systems. The use of a communication system, either low-tech or high-tech, did have a positive impact on many of the language and communication interaction measures. There was no change in the Percent of Consonants Correct or Percent of Vowels Correct across conditions, indicating that the use of a communication system did not impact the child’s articulation of words. However, it was not expected that a communication system would improve the actual accuracy of speech productions in a positive or negative way. There was an increase in the Mean Length of Utterance when both low-tech communication boards and high-tech voice output communication devices were use, which means that the children were combining more words to make longer phrases or sentences when they used a communication system as compared to their speech alone. There was an increase in the use of adjectives when both communication systems were used as well, but this impact was not seen for other grammatical components of language. 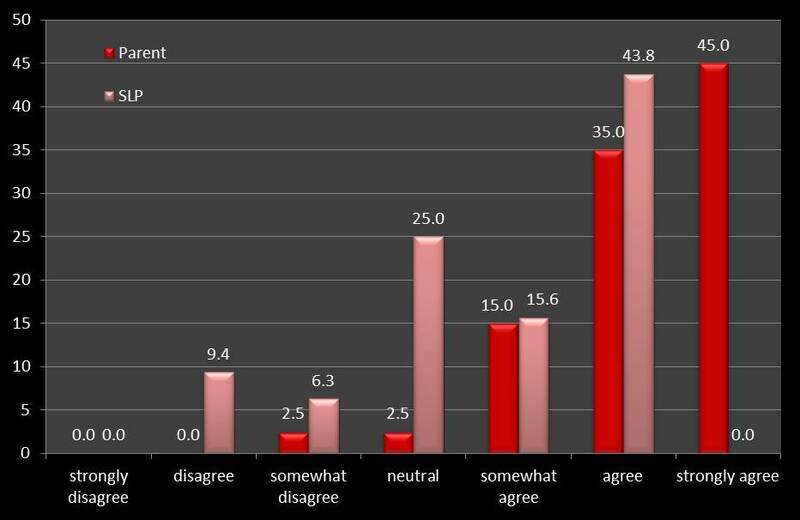 There was a decrease in the use of yes/no responses when high-tech communication devices were used. This means they were not giving yes/no answers as often, but were providing more complex answers. When Communication Interaction was measured, there were many benefits seen in the use of communication systems. There were a decrease in responses, and an increase in initiations for children using both low-tech and high-tech communication systems. This means they were not just responding to questions, but they were initiating communication more often and helping to direct the conversation. This resulted in an increase in comments, where the child initiates sharing information on a topic. There was also an increase in recodes, or clarification or expansion of a communication attempt, when either a low-tech or high-tech communication system was used. There was a slight benefit in the use of low-tech communication boards on the increase of obliges, which is asking a question or making a statement that requires a response from your communication partner. There were more adequate, or accurate, responses when high-tech voice output communication devices were used, as compared to speech only and low-tech communication boards. There was also a decrease in no responses, which is ignoring or not responding to a question asked, in all three conditions as compared to baseline data. This means that the children were attempting to communicate more overall. See the table below for a summary of the results. Both low-tech communication boards and high-tech voice output communication devices showed a significant benefit over the use of speech alone in communication. The biggest changes were seen in Communication Interaction measures. They were able to initiate, comment on topics, ask questions, and clarify their messages more. They also used longer phrases and sentences when communication systems were used and increased their use of adjectives. The use of these systems did not have a negative impact on their speech productions either. There were benefits of both low-tech and high-tech communication systems, but high-tech voice output devices had a slight advantage, as they lead to a decrease in reliance on yes/no answers to questions and an increase in accurate responses in this study. This advantage was slight, and much less than was hypothesized. This may be because the low-tech communication boards used in the study consisted of screen shots from their DynaVox pages. This was done to make the two systems as comparable as possible, but it is not how low-tech communication boards are typically set up. These were full communication pages, not anything like a Picture Exchange Communication System (PECS) notebook. These low-tech systems contained vocabulary focused on building sentences, commenting, giving an opinion, and asking questions (core word pages, quickfires/chat, and my phrases). This type of vocabulary is important for growth in many of the measured areas, and it should be included in all forms of communication systems for children with CAS, low-tech or high-tech. Traditional PECS systems typically allow for some combining of words (I want ___, or colors + objects), but they focus on requesting items. They do not typically support commenting, asking questions, or stating an opinion. These types of communications are typical for children, and inclusion of this vocabulary is critical to see changes in communication interaction as described above. Page editing software is typically free to download for most dynamic display voice output communication devices. This can be used as a guide to identify vocabulary that is important to include when setting up communication systems for children with CAS. Blank, M., & Franklin, E. (1980). Dialogue with preschoolers: A cognitively-based system of assessment. Applied Psycholinguistics, 1, 127-150. Culp, D. M. (1989). Developmental apraxia and augmentative or alternative communication-a case example. Augmentative and Alternative Communication, 5(1), 27-34. Cumley, G. D., & Swanson, S. (1999). Augmentative and alternative communication options for children with developmental apraxia of speech: Three case studies. Augmentative and Alternative Communication, 15(2), 110-125. Lewis, B. A., Freebairn, L. A., Hansen, A. J., Stein, C. M., Shriberg, L. D., Iyengar, S. K., et al. (2006). Dimensions of early speech sound disorders: A factor analytic study. Journal of Communication Disorders, 39, 139-157. Millar, D. C., Light, J. C., & Schlosser, R. W. (2006). The impact of augmentative and alternative communication intervention on the speech production of individuals with developmental disabilities: A research review. Journal of Speech, Language, and Hearing Research, 49, 248-264. Overby, M., Carrell, T., & Bernthal, J. (2007). Teachers’ perceptions of students with speech sound disorders: A quantitative and qualitative analysis. Language, Speech, and Hearing Services in Schools, 38, 327-341. Stading, K., Ball, L. J., Larson, D., & Dulany, S. (2005). AAC strategies to increase expressive communication: Childhood apraxia of speech. Paper presented at the Poster session at the Annual Convention of the American Speech-Language-Hearing Association. Are you considering an iPad for your family with an eye on the benefits for your child with apraxia? Do you have an iPad and are not sure how to maximize its positive effects? Are you considering an iPad for your family with an eye on the benefits for your child with apraxia? Do you have an iPad and are not sure how to maximize its positive effects? How can you justify spending the bucks on such a cool toy for your family or school? The iPad provides an accessible, portable, dynamic and exciting playground for children with apraxia. In fact, this technology has benefits that other technologies and therapy activities lack. The iPad’s small size and weight (1.3 lbs.,) touch screen, fast load time, numerous applications and high quality audio recording capabilities merge to have a potentially huge impact on communication success. As we know, children with apraxia have some common characteristics. For example, they benefit from opportunities to practice target sound sequences frequently. Our children do best when their experiences alternate between high and low communication demands. Accurate and supportive feedback speeds up speech learning. Children with apraxia benefit from feeling our cues as well as hearing and seeing cues to encourage understandable speech. Thoughtful use of the iPad can address these distinctive needs and be part of a solution to help our children reach their potential. Does your child hate to practice speech sequences over and over? Often, this repetitive practice is hard work, with no intrinsic communicative value and children resist. With a motivating ‘app’ and quickly alternating turns, the iPad can encourage your child to practice, practice, and practice without distress. With the iPad you can easily switch between activities with little time or preparation. This feature allows the users to rotate between activities with ease. It is easy to switch from verbal to nonverbal activities, alternating the communication demands. By using proficient skills, practicing emerging skills and learning new skills alternatively, our child with apraxia is anchored in success while risking more difficult sound sequences. The iPad can provide feedback and cues to our child. Some apps cheer, clap or even groan! With the iPad’s built-in microphone and speakers, children can hear and compare their own sound productions with that of a stable auditory model. And it sounds fabulous! With the vast number of applications available, the iPad can provide visual cues that are motivating and high quality. With some practice [and a sturdy hand], the adult can incorporate tactile and kinesthetic cues while sharing an iPad activity. Still not sure about the iPad? Then consider the iPod Touch. It is less than half the price and very light weight [.2 lbs]. Its size can make sharing an experience a bit more difficult but certainly worth considering. One last note, I have no investment, financial or otherwise, in Apple or any of its subsidiaries! Heather Leavy Rusiewicz, Ph.D., CCC-SLP, Katie Cunningham, M.S., Theresa Ptakowski, Leah Bunch, B.A. The purpose of this study was to explore parent and clinician reported perspectives and experiences six months after the introduction of iPads and relevant applications. This study was part of a larger investigation associated with the iPads for Kids with Apraxia Pilot Program initiated by the Childhood Apraxia of Speech Association of North America (CASANA). CASANA provided 40 children with CAS an iPad and appropriate applications free of charge to support their treatment. This study sought to investigate the impact of the implementation of this technology in therapy and at home. Despite widespread and rapidly growing use of iPad and related application technology, there is limited empirical data on the specific use of iPads in treatment for individuals with communication disorders (though see growing literature base in the area of autism spectrum disorders: Kagohara, et al., 2013). 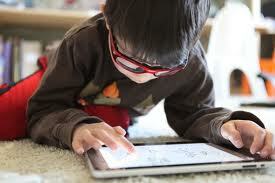 Additionally, there are no current examinations of the use of technology, in this case iPad applications as a tool to increase speech sound accuracy (though see DeThorne, et al., 2009) rather than a facilitator of communication in children (e.g., Cumley & Swanson, 1999; Miller, Light, & Schlosser, 2006 for a review). Likewise, the value of studying the qualitative experiences of those affected by communication disorders and their surrounding community is also growing in terms of scope and application (McCormack, et al., 2010a; 2010b). Moreover, though our understanding of treatment related outcomes for children with CAS is improved from the publication time of the ASHA (2007) Technical Report on CAS, this study contributes to the still relatively sparse literature base on treatment of severe speech disorders associated with CAS. What are parents’ perceptions of the effect of iPad use on their children’s speech production skills and overall communication? What are SLPs’ perceptions of the effect of iPad use on their client’s speech production skills and overall communication? What are the experiences associated with iPad implementation during the first six months of use as reported by parents of children with CAS? What are the experiences associated with iPad implementation during the first six months of use as reported by clinicians of children with CAS? A combined quantitative and qualitative group pretest-posttest research design was employed. Surveys were used for quantitative comparisons. 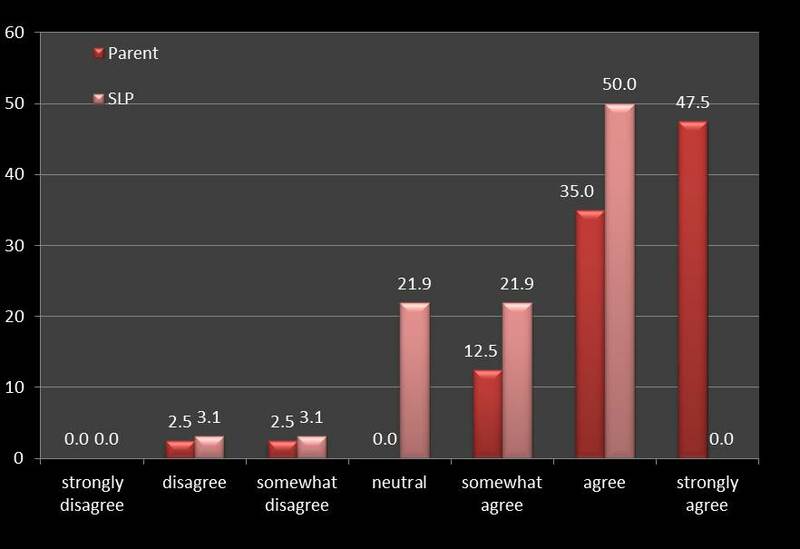 Quantitative data were collected via seven-point Likert-type scale survey items. Qualitative data were collected using open-ended questions regarding parental and clinician experiences. Eighty total participants were enrolled, including 40 guardians and 40 SLPs of the children (32 boys; 8 girls) that were selected by CASANA as part of their iPads for Kids with Apraxia Pilot Program following extensive applications and review. The children averaged 6.9 years of age (SD=3;0 y.o; range 3;0 – 16;3 y.o.). According to the parents and SLPs, all children had received a primary speech diagnosis of CAS. According to the clinicians, 14 did not have any noted concomitant diagnoses. All 40 parents and 32 of the SLPs completed the post-test survey. Each participant digitally completed a total of four surveys. The guardians and SLPs also completed two additional surveys (see attached) via www.surveymonkey.com. The first set of surveys was completed prior to receiving the iPad and the second set of similar surveys were completed six-month after the iPad applications are initiated. The post-test survey responses are the focus of this study. Though there was attrition of eight SLPs for the post-survey, all guardians completed the second survey. Posttest surveys consisted of 30 close-ended and 10 open-ended items for parents and 18 close-ended and 16 open-ended items for SLPs. Though not analyzed for this study, the Focus on the Outcomes of Communication Under Six (FOCUS) Survey (Thomas-Stonell, Oddson, Robertson, & Rosenbaum, 2009) was also completed by the parent and SLP before and after iPad implementation. The quantitative data were descriptively analyzed and between group comparisons were analyzed using independent t-tests. The qualitative data were analyzed by the first author using a phenomenological approach (e.g., van Manen, 1990). The content from each response was initially coded for thought units, and then reanalyzed to collapse the codes into emergent themes/subthemes. A second author completed reliability on the entire qualitative dataset by examining the transcripts given the list of themes/subthemes to check that the “themes appropriately encompassed the codes” (McCormack, et al., 2010a, p. 383). Agreement between the two coders was high for both parent codes/themes (r=0.75) and SLP codes/themes (r=0.76). Overwhelmingly, parents (M=6.53; SD=1.06) and SLPs (M=5.66; SD=0.63) indicated that the children were willing to use the iPads. Almost all of the parents (39/40) stated that they would continue to use the iPad , while 27 (84%) of the SLPs stated they would continue use of the iPad in therapy. Though most parents (M=6.18; SD=1.11) stated that the iPad technology was beneficial in facilitating accurate speech production, SLPs were less in agreement (M=5.66; SD=1.07; t = -5.15, p<.0001) (Figure 1). Likewise, a discrepancy of parental report and SLPs (M=6.18; SD=0.96) of iPads benefitting overall communication compared to SLPs accounts and SLPs (M=4.78; SD=1.34) was reflected in the data (t = -4.06, p<.0001). Parents and SLPs both perceived the other (M=6.25; SD=0.83 and M=5.59; SD=0.71, respectively) as being competent with the iPad and its applications. Four of the SLPs (12.5%) used the iPad very little in therapy due to behavioral issues or concerns of the school regarding the iPad being misplaced or broken. These participants were excluded. Other responses of SLPs and parents were excluded for providing general information rather than answering the question provided or not responding. Data are presented for the following qualitative items, description of the individual’s initial experiences with the device, perceived benefits of implementing the technology and perceived obstacles associated with iPad implementation. For each item, a table presents the most frequent themes that emerged and example responses are provided. Overall, parents and therapists reported positive perceptions of and experiences with iPad technology at home and during intervention. Shared themes of excitement, motivation, immediacy, and the ability to practice outside of the therapy environment emerged. Likewise, common challenges were noted in shared themes of impulsivity/behavior, confusion/frustration of adult, desire to play instead of practice, and school/transportation issues. Clinical implications of this study include that iPad technology may be a particularly useful tool for extending speech sound intervention outside of therapy settings. This study suggests that a phenomenological approach is a valuable methodology to employ concurrently with quantitative methods. Thus, this study provided quantitative and qualitative information on the impact and experiences of iPad technology for children with a significant speech sound disorder and provided support for the integration of this technology in treatment as well as a focus of future experimental investigations. Future studies may elucidate the utility of iPads for speech sound practice versus communication device for children with severe speech sound disorders (SSDs) such as CAS. These data, combined with the continued growth of such tablet technology, strongly point to the need for a study of treatment efficacy using applications in the treatment of CAS and other SSDs. Acknowledgments: We are grateful to CASANA and the families and therapists that participated in this investigation. American Speech-Language-Hearing Association. (2007). Childhood apraxia of speech [Technical Report]. Available from http://www.asha.org/policy. Cumley, G. & Swanson, S. (1999). Augmentative and alternative communication options for children with developmental apraxia of speech: three case studies. Augmentative and Alternative Communication, 15(2), 110-125. DeThorne, L.S., Johnson, C.J., Walder, L., Mahurin-Smith, J. (2009). When “Simon Says” Doesn’t Work: Alternatives to Imitation for Facilitating Early Speech Development. American Journal of Speech-Language Pathology, 18, 133-145. Kagohara, D.M., van der Meer, L., Ramdoss, S., O’Reilly, M.F., Lancioni, G.E., Davis, T.N, Rispoli, M., Sigafoos, J. (2013). Using iPods and iPads in teaching programs for individuals with developmental disabilities: A systematic review. Research in Developmental Disabilities, 34, 147-156. McCormack, J., McLeod, S., Harrison, L.J., McAllister, L. (2010). The impact of speech impairment in early childhood: Investigating parents’ and speech-language pathologists’ perspectives using the ICF-CY. Journal of Communication Disorders, 43 (378-396). Miller, D., Light, J.C., & Schlosser, R.W. (2006). The impact of augmentative and alternative communication intervention on the speech production of individuals with developmental disabilities: A literature review. Journal of Speech, Language, and Hearing Research, 49, 248-264. Thomas-Stonell, N., Oddson, B., Robertson, B., & Rosenbaum, P. (2009). Predicted and observed outcomes in preschool children following speech and language treatment: Parent and clinician perspectives. Journal of Communication Disorders, 42(1), 29-42. Van Manen, M. (1990). Researching Lived Experience: Human science for an action sensitive pedagogy. London, Ontario: The Althouse Press. © copyright. Childhood Apraxia of Speech Association of North America. All rights reserved. Many families ask about tablet applications – “apps” – specifically for childhood apraxia of speech. Please know that apps should be used with therapist and parent supervision to support the child’s speech practice or to assist them in their communication attempts. Some apps are for speech practice while others are for providing an augmentative/alternative communication tool. Why are so many families pursuing tablets and apps for their children with apraxia? For a number of reasons – that many children are quite fascinated and engaged by the interactive nature of apps and because they provide other ways to communicate what children who struggle to speak want to say and what they know. Apps can help extend speech, language and educational practice and/or can be used for motivation and reinforcement for practice. Due to the ever changing nature of technology, new apps are always available. Apraxia Kids has partnered with Penn State Health to share and distribute the Speech and Language Apps guide published by the The department of Behavior and Developmental Pediatrics at The Penn State Hershey Children’s Hospital. Apraxia Kids does not endorse any specific apps nor is this list all-inclusive. The directory is meant only to be a guide/resource.